So I recently found out that I’ve officially lost the rights to my name. Well, actually it was a business name from my past, that started out as a nickname. 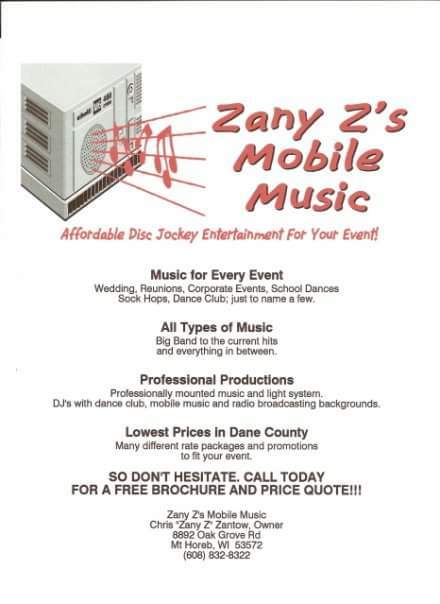 First, let me tell you about how I wound up with the nickname Zany Z and then I’ll get to how it became the name for my mobile DJ service. 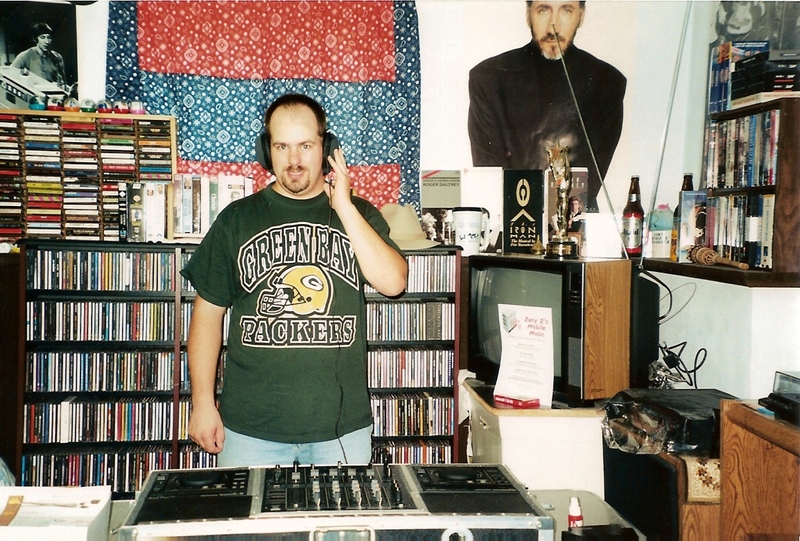 The year was 1991 and I had just started working at WRDB-AM/WNFM-FM in Reedsburg. I had recently graduated from broadcasting school, so this was my first real radio job as an announcer. The crappy internships where I had to dress in costume and do demeaning things for little or no pay were behind me. This was real radio, baby – or at least it seemed real to me. Then I heard another announcer call himself “the captain of the airwaves” or something to that effect during his air shift. It reminded me of broadcasting school and some of the fake monikers that students took on during their practice air shifts. A couple of us started calling our co-worker “Captain Adam” in what we thought was jest, but the name stuck as it was catchy and likeable. The Captain asked me if I had a nickname that he could call me, and I said “Crazy Chris” as it was from broadcasting school. I recorded a few mock promos in school for the “Crazy Chris Mad Morning Madhouse.” The “Mad” part of the name was a play on WMAD – the radio station where I had my fake morning show. Captain Adam said he didn’t care for the Crazy Chris nickname and thought I needed something more fitting. He wanted to play off my last name with a nickname. Many friends over the years said a name starting with Z was perfect for a nickname, so I was christened Zantmandu, Zantonio, Z Man, and just plain old Z. Captain Adam wound up calling me Zany Z, and the name just stuck more than the others. He became one of my best friends in the radio industry, and not just because he gave me a fantastic nickname! I loved the Zany Z alter-ego and did a few mock promo recordings both by myself and with Captain Adam using the name. A couple of those “may” have slipped onto the WRDB airwaves (heh heh) during my nearly two years on the air at that particular station. When I moved on to working in Madison radio, the funny promos stopped, but the name remained on my personalized license plate. 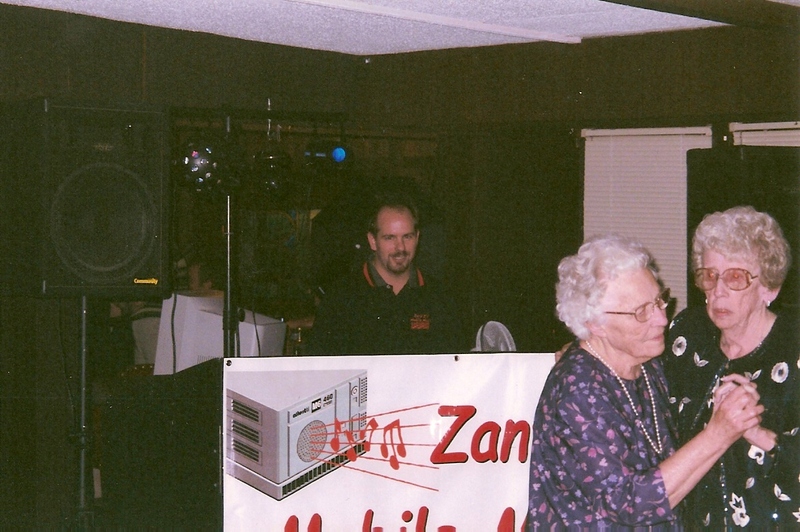 By 1999 I was out of radio but wanted to start my own mobile DJ service. I was a club DJ as part of one of my broadcasting school internships, and did it for a while as a side job when I first started in radio. I really liked seeing people dancing and enjoying themselves, and the two-way interaction was at a much higher level than me talking into a microphone in a small radio booth. So I bought equipment and added countless CD’s to my music collection as a first step in starting a business. DJ in a box! 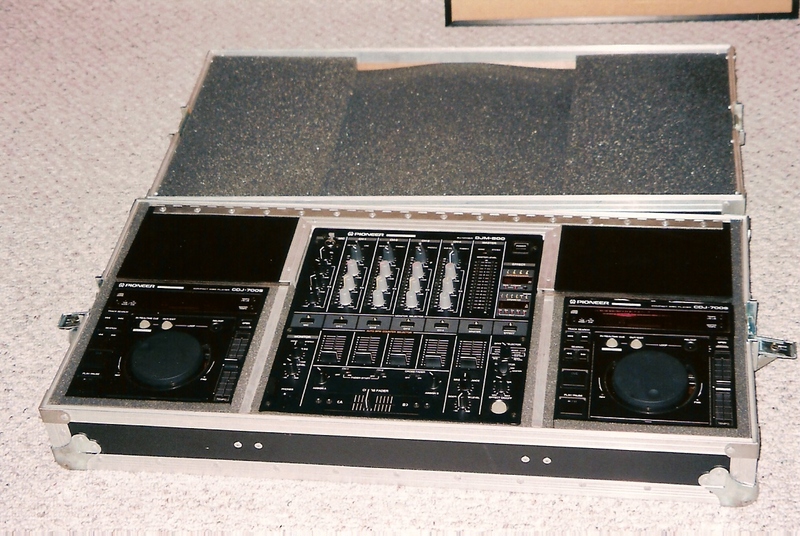 Two CD players and a mixer. But I needed a name. I wanted to avoid the standard “Mobile Music on Wheels” type nicknames and come up with something unique and memorable. The choice was obvious as far as I was concerned. 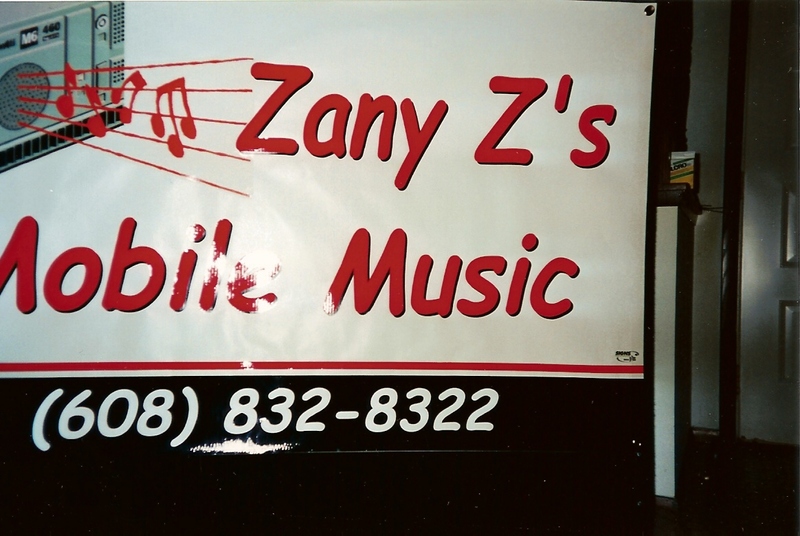 Use my nickname and call the business Zany Z’s Mobile Music. I took the name to a good friend I knew at my day job, and she created a logo that went on flyers, business cards, sample music lists, and a banner that covered a foldable wall that went in front of my equipment as a barrier. After a year of collecting music, practicing setting up and tearing down the equipment, and the most important part – playing a mock gig for 4 hours, I was ready to go. A few of those shows really stick out in my mind. 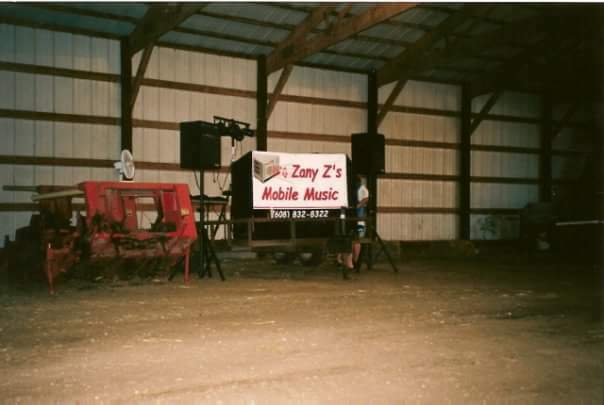 The barn dance was a crazy event with people climbing on tractors and equipment to dance. It was more like a shed dance on a farm, but no matter how it was described, it wound up being memorable just because of the atmosphere. The Park Ponderosa was owned by my Uncle’s brother and sister-in-law, and had an elevated stage. The Ponderosa had everything from orchestras to big bands on that stage over the years, so it was really cool for me to play there. The dance floor was huge, and of course we challenged ourselves to get as many people on the floor as possible. We played many interesting shows there, from a Sunday afternoon class reunion that only wanted 1950’s/60’s pop/rock and big band music, to a wedding that kept paying us extra money so we’d keep playing until bar time at 2:00 a.m. (we were scheduled to quit at midnight). Playing the Middleton VFW wedding gig was another show not to be forgotten. The VFW was too small for us to set up the equipment in advance. Most wedding dances were in a place like Wildcat Lanes with a huge space, so we could come in at some point before the reception, set up the equipment, and leave. The VFW gave us a small window where they would start breaking down reception tables at 6:45 p.m., giving us a whopping 15 minutes to drag everything in and get set up to start at 7:00 p.m. We had gotten pretty good at breaking down and getting out of places in 15 minutes, but usually we had all the time in the world to set up. But somehow we did it, but our sweat didn’t end there. The bride and groom wanted a lot of newer heavy rock acts (at the time) like Slipknot, and I didn’t have much of that in my collection. The groom furnished a lot of music he wanted to hear, alienated the older folks that came for the reception and dance, and ended the night on a high note with just his friends dancing – if you’d call it that. Despite having fun and making a decent second income, after a couple years I decided to call it quits. The late nights were taking a toll as I was working full time (and overtime every chance I got during the week). I spent 45 minutes on the road each way to and from work, and started to see my free time evaporating. Setting up early in the day before a gig was nice because it was relaxing, but at the same time it meant that I needed to go kill time. I was often too far away from home to return for a much-needed nap. I entertained the idea of just letting others run the shows while I collected the money, but wanted to be all-in or all-out. I chose out. …the Zany Z name lives on! Last week when I was bored, I Googled Zany Z just to see what might come up. I didn’t figure I’d see much even close to my old nickname. 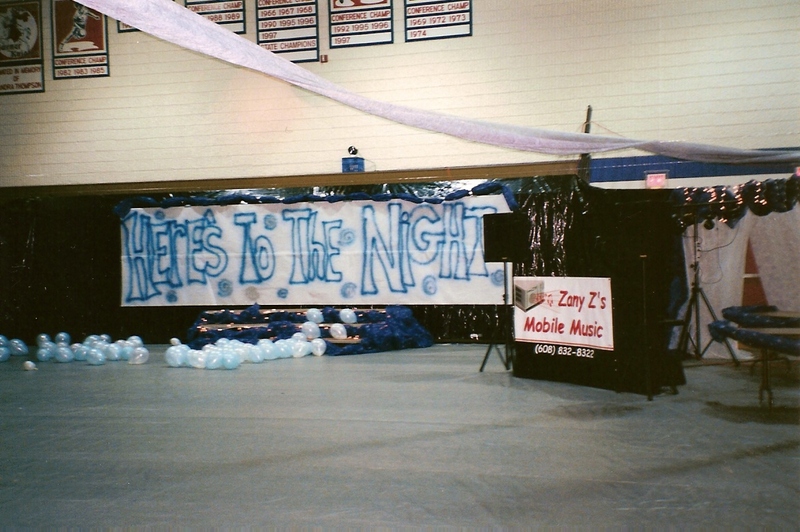 The Zany Brainy educational retailer that catered to kids went defunct about the same time as my DJ service. Imagine my surprise when I found this website for Zany Z Golf – the top result in a Google search. Holy smokes! That is really cool in my opinion. She was 11 years old when she founded the company and I think her apparel is special. You really should take a moment and read the Zany Z Story on the site. I have to give her two thumbs up and I hope the company does well. 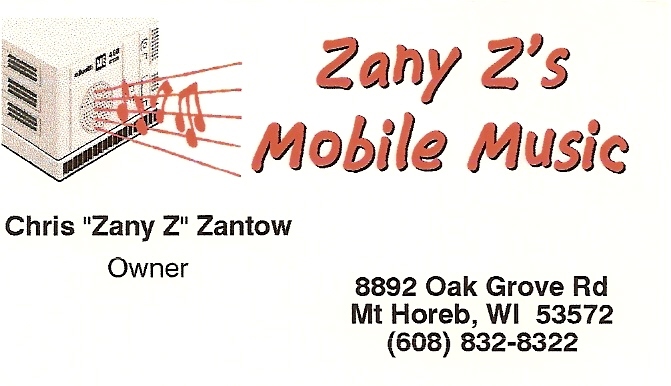 With a name like Zany Z, it’s going to stand out in the crowd for sure. According to a tweet in December, 2016, the Zany Z name is a registered trademark. So as I said at the beginning of this post, my name is gone…but lots of fond memories remain. A wedding dance…fun for all ages!